There is art. There is beer. This is where they meet. 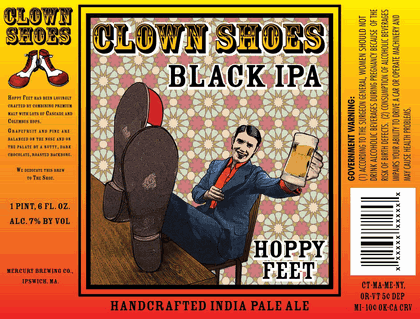 Let's take a look at all of the current labels by the Massachusetts brewery Clown Shoes. The Hoppy Feet Black IPA artwork is mostly defined by how weird it is. The shoes are huge (obviously), the background is like a bad linoleum, the bright red and yellow fade brings out the harshest colors in the pint-hoisting, slick-haired character (is it just me, or is he the devil? ), and the lettering has to be outlined in white to avoid causing seizures. And I fully believe all of it is intentional, aiming to create the disconcerting effect one might expect from a brewery called "Clown Shoes." It's well-designed; just not exactly comfortable to look at for extended periods of time. 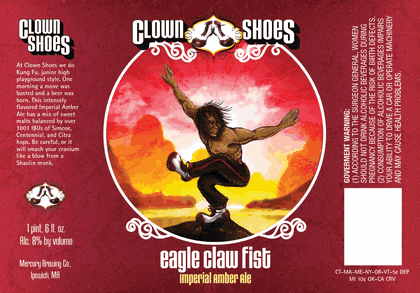 The Eagle Claw Fist shares basically no design elements at all with the Hoppy Feet, aside from the ridiculous shoes from whence the brewery derives its name. If the figure looks like he might be better schooled in Karate Kid than Issinryu. 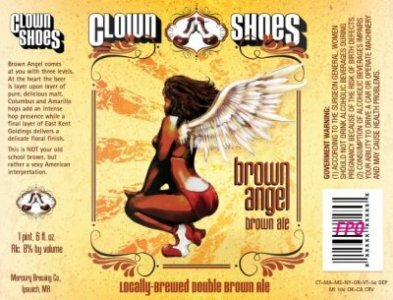 As the label says, this is "kung fu, junior high playground style"
The Brown Angel uses color contrast brilliantly, to make the angel still seem radiant and angelic despite a darker color than the backdrop and lingerie. The clown shoes are a nice touch, but the light reflection in the small of the back and the rightward radiating beams are what pull the label together. Sadly, I couldn't find a great quality image for the Clementine, but the major elements are still clear. The use of color again shoes an intelligence in design. Any time you can make one shade of blue stand out from another, you're managing your color palette well. The blue and green make the orange pop to the point where it looks like there's a lot more clementine color than there actually is in the piece. The slanted lines in the Earth and the counter-prevailing ribbons keep the image interesting with a sense of movement. So, in the Clown Shoes oeuvre (art crit term for "body of work") we see cohesion, but not in subject matter (aside from the shoes) or composition. Rather, the work is defined by a consistently subtle use of color and movement in the pieces, and, of course, a hallmark sense of humor and irony. As the craft beer boom has introduced us to myriad and delicious flavors, it has also spawned a great deal of art and design work. Craft breweries are more than just sources of intoxication; they are community hubs for all types of creativity. So this Pour Curator will try and look at craft beer's contributions to art, whether it's through label art, posters, tap handles, or something even stranger, preferably with a glass or goblet of deliciousness in hand. Simply Beer Taps: High quality draft equipment, kegerator kits, and beer taps. Rehab Info is comprehensive resource on alcoholism and treatment.